The January 11 broadcast of KBS2's 'Happy Together 3', featured DIA's Jung Chae Yeon as one of the talk portion guests, which led to the topic of idols dating in private. 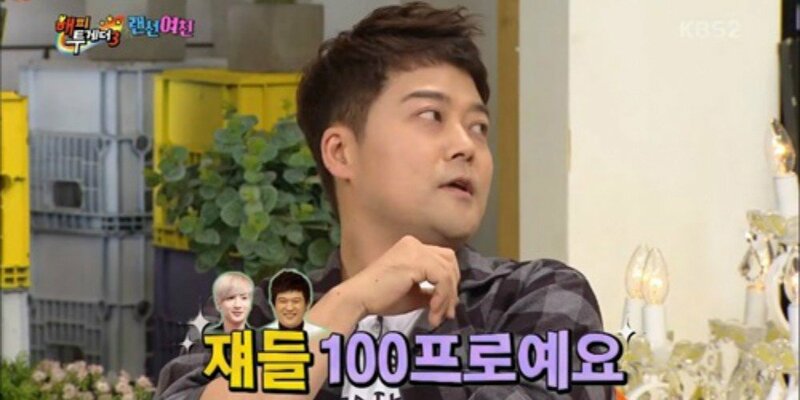 During the talk, MC Jun Hyun Moo pointed out that he knows exactly which idols are dating, thanks to his experience MC-ing the 'Idol Star Athletics Championship'! When asked if she had any idol dating restrictions, Jung Chae Yeon cautiously said, "Our CEO told us, 'I don't think it's the right time for you guys to be dating yet. You're better off focusing on your activities at the moment.'" But MC Yoo Jae Suk chimed in, "But still, people who want to date get away with it," to which Jun Hyun Moo added, "I have experience as an MC on 'ISAC'. I can just tell; I see everything. And with Super Junior's Leeteuk and Shindong by my side, it's a lot easier to spot things." Jun Hyun Moo continued, "I can clearly see when an idol star who is 3-4 years into their career, makes loving eye contact with someone else. And Leeteuk stares at them and goes, 'Those two are in it 100%.'" At the end, he tagged on, "It'll be a big problem if I open my mouth and say anything further," causing laughter.